Groveport Madison Schools welcomes the involvement and interest of senior members of our school district. As such, the District has established the Golden Cruiser Club as a way to encourage area senior citizens to enjoy – free of charge – the many exciting and entertaining performances, contests and events that highlight the skills and talents of our students. 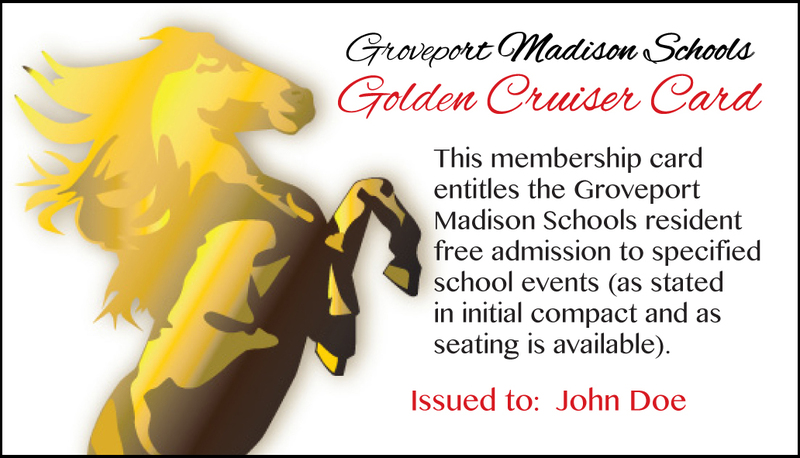 The Groveport Madison Schools Golden Cruiser Club is a no-cost, membership-based program that provides members free access to all District- and school-sponsored athletic, performing arts and other events to residents of Groveport Madison Schools (GM Schools) who are 60 years of age and older. The program is designed to encourage senior residents to attend and support the wide array of student activities and events taking place in our schools. Golden Cruiser Club members will be issued an identification card that ensures free entry to all home, regular season Basketball, Football, Track, Wrestling, Soccer and Volleyball contests. Club members also may attend all school plays, concerts and performances at no cost. Membership in the program is free to Groveport Madison Schools residents who are 60 years of age or older. Residency within the District will be verified through the Franklin County Auditor’s website. Free access to events is only granted to the issued cardholder. In order to gain entry to any events, Golden Cruiser Club members must present their card and a photo ID to the ticket sellers. Not valid for Championship events or Ohio High School Athletic Association (OHSAA) tournament games. Due to fire code regulations, Golden Cruiser Club membership does not guarantee entry into events which are sold out or beyond the posted capacity of the venue. Card is valid only for the issued cardholder, and requires a photo ID be presented at the time of entry. Interested senior residents may complete an application (available for download here) and in hard copy at the District’s schools and administrative office) and submit a copy of the resident’s driver’s license/state-issued identification. These documents should be emailed or returned to the District’s Marketing, Communications & Community Relations Office, where the requestor’s age and residency within the school district will be verified, and a membership card will be issued.